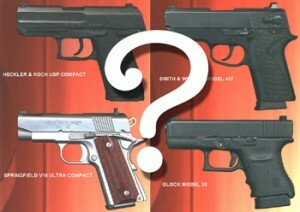 Which pistol to select for concealed carry? This is the oldest autoloader design still in service, designed by John Browning (with the help of the Army Ordnance Board) during the period between 1905 and 1911. The hammer must be cocked, generally by racking the slide, for the gun to fire. This design in .45 ACP, .40 S&W and .38 Super is favored by competitive shooters, FBI SWAT, FBI Hostage Rescue Team, and many special forces units because it has the best trigger, outstanding accuracy and is very fast. For the gun to be carried in a state of readiness, the hammer must be cocked and the manual safety applied, “cocked and locked” (see “The Conditions of Readiness“). This looks scary and is not recommended for novices or those suffering from attention deficit disorder. I wouldn’t be comfortable with anything smaller than a .380 (actually, I wouldn’t be comfortable with anything smaller than a .45 ACP, but that’s a different argument. See also Jim Higginbotham’s “Case for the .45 ACP”). My personal favorite handgun cartridge is the .45 ACP because of its power and accuracy, but smaller cartridges will do the job if you do your part. Like the selection of the gun, the selection of a cartridge should be based on your ability to shoot it well. A good hit with a .380 is better than a miss with a .45. So, as a general rule, your self defense cartridge should be the largest and most powerful load that you shoot well. I would also maintain a healthy degree of skepticism toward articles in popular gun magazines. They don’t make money by trashing the offerings of their advertisers. You will notice that I have said nothing about price. I really hate to hear people making a decision on a handgun based on price. No one wants to pay more than we have to or what is fair, but price should be the last consideration. You won’t remember a hundred or so dollars extra you paid for the right pistol, but you will remember the ill-fitting bargain pistol that doesn’t shoot right or feel good. Your personal defense weapon should be as large and as powerful as you can shoot accurately and carry with a reasonable degree of comfort and concealment. Your personal defense weapon should fit your hand perfectly. You should be able to manipulate the controls of your weapon with either hand alone. Your personal defense weapon should be of sturdy construction and be able to withstand heavy use and rough handling. Your personal defense weapon should be accurate enough to consistently hit a target the size of a saucer at 10 yards quickly. Select the largest caliber you can shoot well, and a caliber for which ammunition is readily available. A good quality holster must be available for the model of pistol you intend to carry. Pistol Packin by Jim Higginbotham. Concealed Carry and the ‘Large’ Auto Pistol by Jim Higginbotham.